Azure Event Grid is a fully managed event routing service that provides uniform event consumption using a publish-subscribe model. In this quickstart, you use the Azure CLI to create a container registry, subscribe to registry events, then deploy a sample web application to receive the events. Finally, you trigger container image push and delete events and view the event payload in the sample application. The Azure CLI commands in this article are formatted for the Bash shell. If you're using a different shell like PowerShell or Command Prompt, you may need to adjust line continuation characters or variable assignment lines accordingly. This article uses variables to minimize the amount of command editing required. An Azure resource group is a logical container in which you deploy and manage your Azure resources. The following az group create command creates a resource group named myResourceGroup in the eastus region. If you want to use a different name for your resource group, set RESOURCE_GROUP_NAME to a different value. Next, deploy a container registry into the resource group with the following commands. Before you run the az acr create command, set ACR_NAME to a name for your registry. The name must be unique within Azure, and is restricted to 5-50 alphanumeric characters. In this section, you use a Resource Manager template located in a GitHub repository to deploy a pre-built sample web application to Azure App Service. Later, you subscribe to your registry's Event Grid events and specify this app as the endpoint to which the events are sent. To deploy the sample app, set SITE_NAME to a unique name for your web app, and execute the following commands. The site name must be unique within Azure because it forms part of the fully qualified domain name (FQDN) of the web app. In a later section, you navigate to the app's FQDN in a web browser to view your registry's events. az provider show --namespace Microsoft.EventGrid --query "registrationState"
When registrationState is Registered, you're ready to continue. In Event Grid, you subscribe to a topic to tell it which events you want to track, and where to send them. The following az eventgrid event-subscription create command subscribes to the container registry you created, and specifies your web app's URL as the endpoint to which it should send events. The environment variables you populated in earlier sections are reused here, so no edits are required. Now that the sample app is up and running and you've subscribed to your registry with Event Grid, you're ready to generate some events. In this section, you use ACR Tasks to build and push a container image to your registry. ACR Tasks is a feature of Azure Container Registry that allows you to build container images in the cloud, without needing the Docker Engine installed on your local machine. Execute the following Azure CLI command to build a container image from the contents of a GitHub repository. By default, ACR Tasks automatically pushes a successfully built image to your registry, which generates the ImagePushed event. You should see output similar to the following while ACR Tasks builds and then pushes your image. The following sample output has been truncated for brevity. This operation will delete the manifest 'sha256:f15fa9d0a69081ba93eee308b0e475a54fac9c682196721e294b2bc20ab23a1b' and all the following images: 'myimage:v1'. You've now pushed an image to your registry and then deleted it. 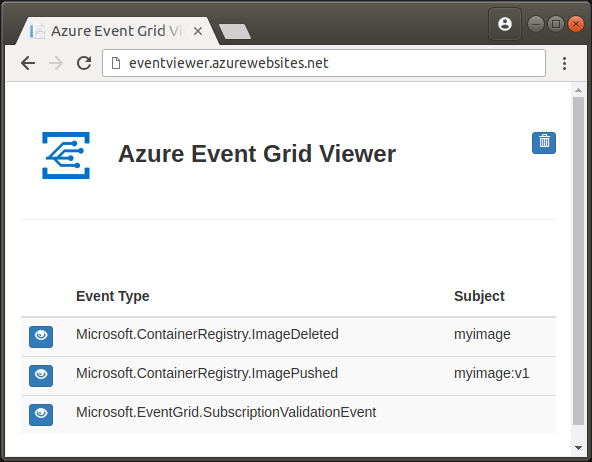 Navigate to your Event Grid Viewer web app, and you should see both ImageDeleted and ImagePushed events. You might also see a subscription validation event generated by executing the command in the Subscribe to registry events section. The following screenshot shows the sample app with the three events, and the ImageDeleted event is expanded to show its details. Congratulations! 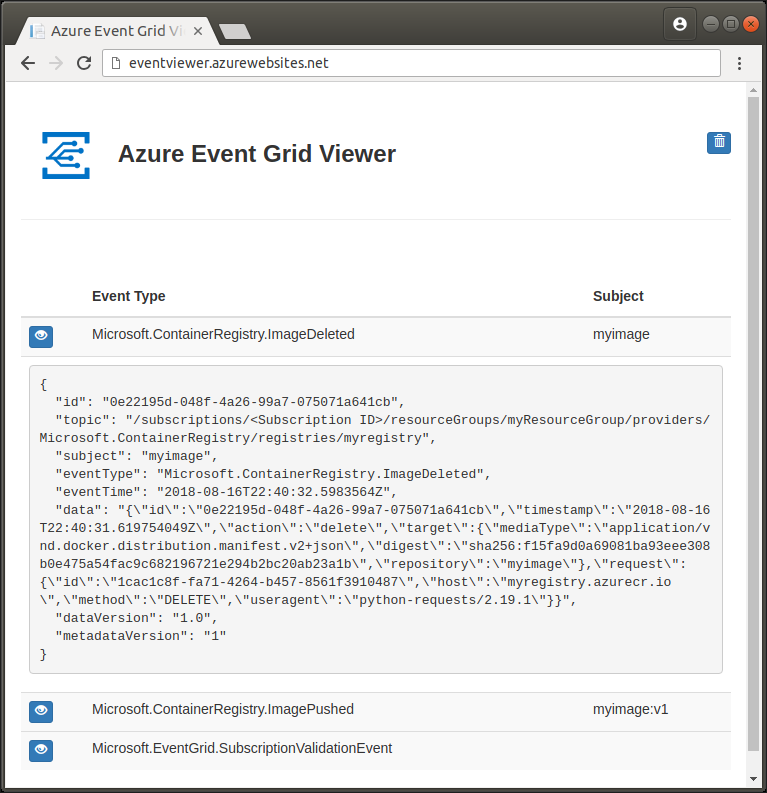 If you see the ImagePushed and ImageDeleted events, your registry is sending events to Event Grid, and Event Grid is forwarding those events to your web app endpoint. Once you're done with the resources you created in this quickstart, you can delete them all with the following Azure CLI command. When you delete a resource group, all of the resources it contains are permanently deleted. WARNING: This operation is irreversible. Be sure you no longer need any of the resources in the group before running the command.